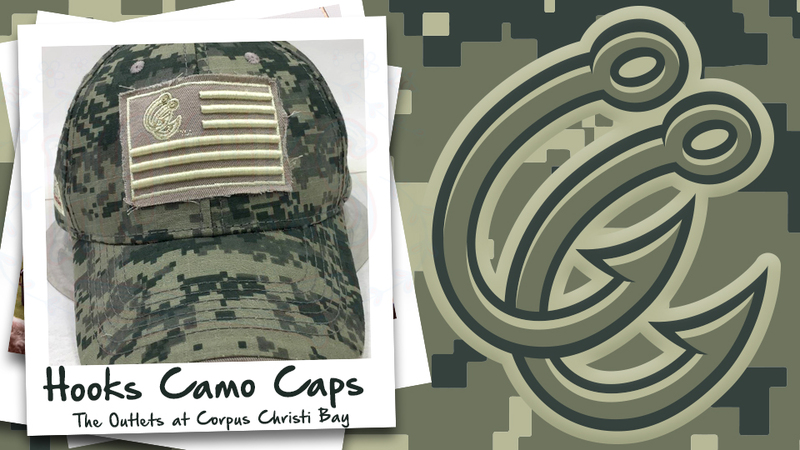 CORPUS CHRISTI - Hooks Camo Flag Caps to the first 1,500 fans from the Outlets at Corpus Christi Bay kick off the team's annual Military Appreciation Night Thursday, June 22. "The Outlets at Corpus Christi Bay are honored to partner with the Hooks for this opportunity to express gratitude to our service men and women, both active-duty and retired," Marketing Director and Specialty Leasing Coordinator Kimberly Perez said. "Their contributions to our safety, freedom, and quality of life are immensely appreciated and we thank them." "We recognize current and former military members at games each night, but Thursday's tribute enables us to go even deeper in demonstrating our appreciation for their sacrifices," Hooks President Ken Schrom said. In addition to Thursday's giveaway, military service members receive discounted tickets at the box office upon presentation of ID. An appearance by Skydive South Texas, a U.S. Navy re-enlistment, and Patriot Riders presence highlight the pregame ceremonies.